The overall face of the funds is loose. The bank's wealth management yield fell to 4.26% and then hit a new low. • A total of 2,125 wealth management products were issued by banks this week, an increase of 328 from last week. • The average annualized rate of return on bank wealth management products fell to 4.26%. 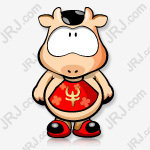 Comments from the financial sector: The initial amount of the wealth management products is 10,000 yuan, and the financial management period is 95 days. The income type is non-guaranteed floating income, and the expected maximum annualized rate of return is 10%. The product was comprehensively scored by the Juling Data & Finance website Financial Products Research Center. The comprehensive score was 99 points, the profitability score was 100 points, the anti-risk ability score was 66.56 points, and the liquidity score was 86.55 points. There are sales. This week (April 8 to April 14), a total of 277 banks issued 2,125 wealth management products, the average expected annualized rate of return was 4.26%, a decrease of 0.01% from last week. From the recent trend of bank wealth management, the downward trend is very obvious. Even at the end of the season, the earnings have not seen any rebound or even continued to fall. The industry believes that the overall market funds will be loose in April, and bank financial management will continue to reform and destock, and the yield will continue to fall. The transition period for the new asset management regulations will be at the end of 2020, during which time bank financing non-compliant products will be further reduced. On the one hand, for products whose non-standard assets have a maturity date before the end of the transition period, they will naturally expire according to the asset maturity date; on the other hand, for products whose non-standard assets have a maturity date after the end of the transition period, ABS can be issued. Non-standard transfer, or through asset transfer, asset return, etc. Industry experts predict that the rectification rate of stock wealth management products will continue to accelerate in the second half of 2019, and the ability to renew new product offerings will not be significantly improved in the short term, or the scale of wealth management will continue to shrink. The average expected rate of return on bank financing will continue to fall as asset prices fall. Listed banks' wealth management income and scale both "slimming"
Under the influence of the new regulations on capital management, banks have accelerated the transformation of the net worth of wealth management products and ordered the decline in the scale of stock products. At the same time, the decline in the income of wealth management business and the scale of wealth management has become a must-have in the transformation process. According to the 2018 annual report of listed banks, the income of bank wealth management business generally declined, and some bank wealth management revenues fell by more than 50%. In the future, the bank's wealth management business will face reshaping, which will have a certain impact on the income of intermediary business. Banks should actively explore emerging intermediary businesses to offset the impact of falling financial income. 1. The number of wealth management products issued by 2125 is 328 more than last week. A total of 277 banks issued 2,125 wealth management products this week. The number of issuing banks increased by 30 compared with last week. The corresponding product circulation increased by 328 compared with last week, with an average period of 170 days, a decrease of 78 days from last week. 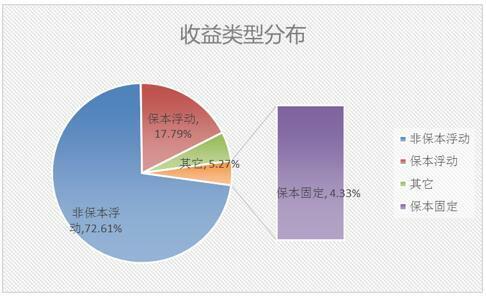 In addition, a total of 2,287 wealth management products expired this week, involving 265 banks. From the top ten banks in terms of circulation, four from state-owned banks, a total of 501; three from joint-stock banks, a total of 193; three from city commercial banks, a total of 123 products. Specifically,Bank of Communications,Construction bankandBank of ChinaRanked among the top three in the distribution of wealth management products, among which, Bank of Communications issued 174 products, an increase of 11 from last week; CCB issued 142 wealth management products, a decrease of 11 from last week; Bank of China issued 141 products, Ten products were added last week. There are no wealth management products with a term of 7 days or less in this week; there are 30 products with an 8-14 day period, and the average expected annualized rate of return is 3.85%; 23 products with a period of 15 days to 1 month are issued, with an average forecast of The annualized rate of return is 3.85%; the total number of products with a 1-3 month term is 346, and the average expected annualized rate of return is 4.09%; the product with a 3-6 month term is issued a total of 805, with an average expected annualized rate of return. Up to 4.25%; a total of 737 products were issued within a 6-12 month period, with an average expected annualized rate of return of 4.3%; and a total of 169 products with a term of more than 12 months, with an average expected annualized rate of return of 4.56%. By ranking the average expected rate of return of 277 banks, it is found that the top ten banks are rural commercial banks, two are city commercial banks, and three are foreign banks. Specifically, the two wealth management products issued by DBS (China) have an average annualized rate of return of 8.75%, ranking first; one of the wealth management products issued by Citi China, with an expected annualized rate of return of 7.5%; Shizuishan Bank The four products issued have an average expected annualized rate of return of 6.00%, ranking third. From the perspective of the most products with expected yields of different maturities, the types of product returns are mostly non-guaranteed floating income. 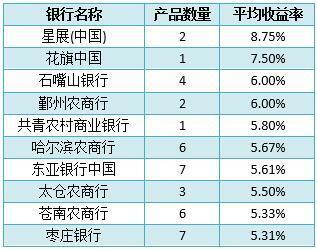 Among them, Quanzhou Bank's 1 product, "Enriching Weekly Rolling (2019-04-12)" took the first place of 8 days to 14 days with a 4% expected maximum yield. 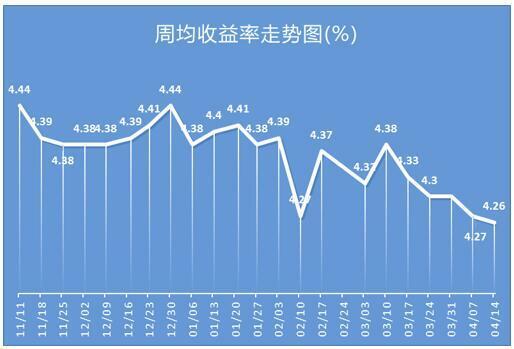 One of Xiamen Bank's products, “Stable Return KF21D145A”, took the first place in the 15-day to January period with an expected yield of 4.2%. One of Bank of Communications’s products, “Delibao•Private Banking 2463190063”, took the first place in the one-month to three-month period with a 9.2% expected rate of return. One of DBS China's products, EZZC, took the first place in the six-month to 12-month period with a 13% expected return. 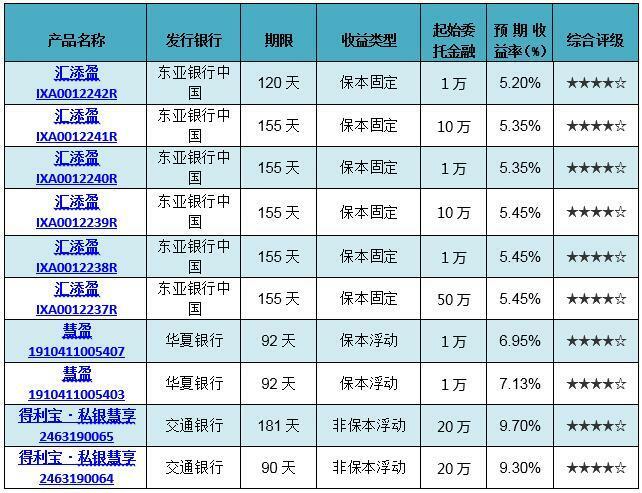 China Minsheng Bank has two wealth management products with the expected yield of 10.5% and 13.2%, respectively, occupying the first place in the period from March to June, 12 months and above. This week, non-guaranteed floating income products accounted for 72.61%, an increase of 1.49% from last week; guaranteed floating products accounted for 17.79%, a decrease of 0.02% from last week; the capital preservation fixed type accounted for 4.33%, a decrease of 0.34 from last week. %; other types accounted for 5.27%. 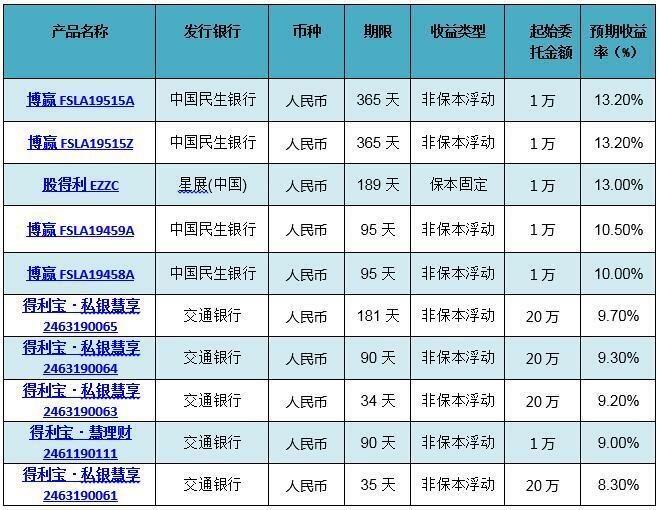 Beijing issued 389 products this week, an increase of 55 models last week, ranking first; Jiangsu Province issued 196 products, an increase of 73 models last week, ranking second. 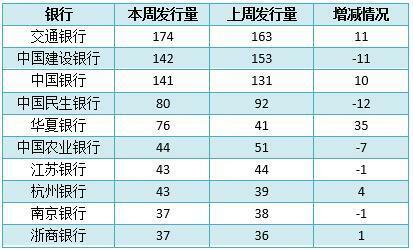 Zhejiang Province issued 177 products, ranking 20th more than last week. In the past, most of the areas were still concentrated in the eastern coastal provinces and first-tier cities.